Summary: Lola Durand hates her stepmother. It’s a cliché but it’s true. Initial thoughts: My initial thoughts were confusion at what had actually happened, who Holly was, what had happened to her, what Lola had done to her. But also I thought about how unlikeable Lola was! Lola has a lot of anger issues and quite justified too but she seems so self centred before the accident with Holly that I did not like her. As the book progresses it details the events that led up to an accident and builds up to reveal who Holly is. It also gives us an explanation as to why the Lola that is writing this story to Holly is so different from the Lola who would steal just to get attention. In the end, I realised I quite like who Lola had become. She is interesting and funny. The story is told as if Lola is writing a detailed chronologically diary of the events to Holly that led to the moment where we find out who she actually is. It was a shock actually to find out who she was, I had not expected it at all. 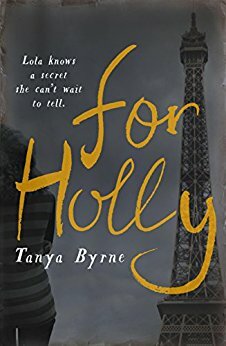 Tanya Byrne writes this story brilliantly, building up the suspense over the mystery of Holly but also the development of Lola is great as well. Lola’s home life is far from ideal and it would cause a lot of people to act out. It is quite tragic and it is a shame that it had to be such a big accident that finally causes her to snap out of it and think of others rather than just focussing on her own rage at the world. Overall: I really enjoyed this book. There is not much I can review about it without giving away too much details but I would recommend it to everyone as it is really well written, the characters are developed thoroughly and it is a really intriguing storyline.